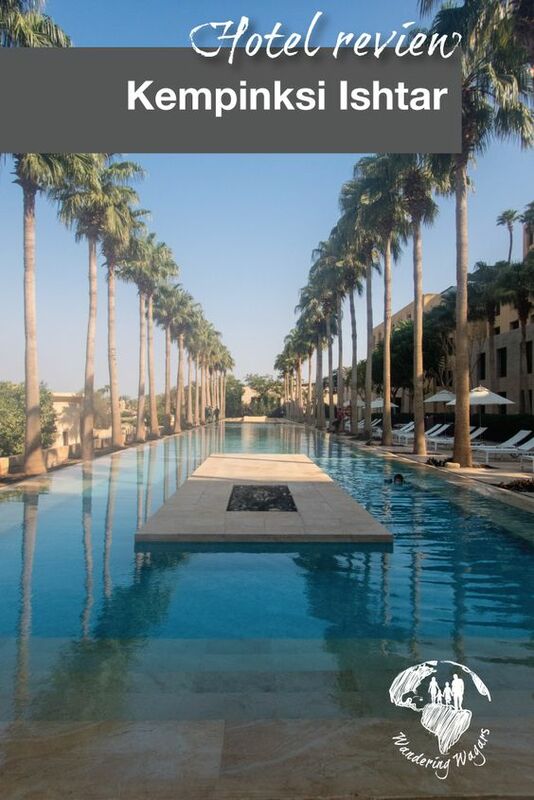 Kempinski Hotel Ishtar: Can we stay here forever? 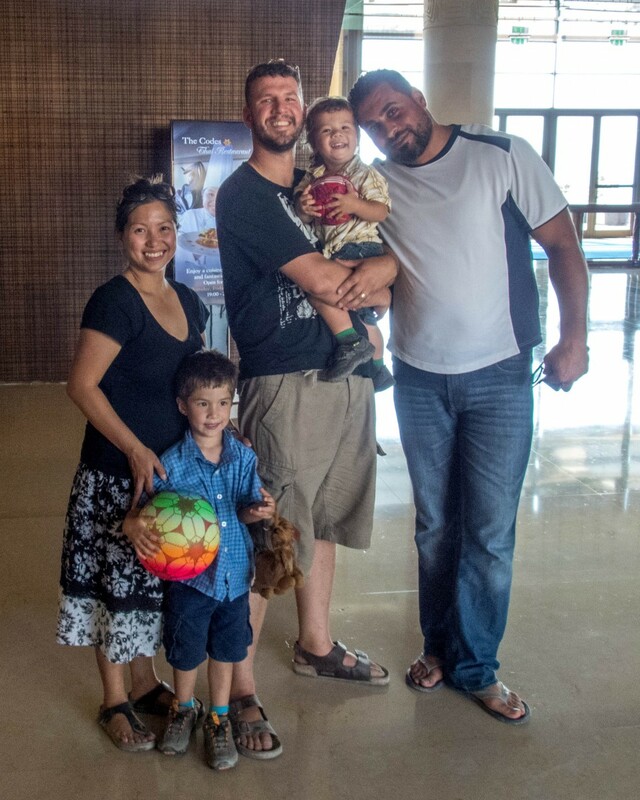 After spending a day scuba diving in Aqaba and experiencing the spectacular Red Sea region we made the 3.5 hour drive on Highway 65 from Aqaba to the Dead Sea. We were anxious to stretch our legs and enjoy a relaxing afternoon at Jordan’s famous Kempinski Hotel Ishtar. As we approached the city our driver, Qais Bader of Jordan Select tours excitedly pointed out the sea of hotels as we drove. He let us know that staying at the Kempinski was a dream of his. Qais made us guess which one the series of massive hotels we thought was the Kempinski. I had no idea but played along. I picked the largest compound of the lot and got a series of high fives from everyone in the car when I found out I was right! 5-star hotels aren’t normally our style when we travel, usually opting instead to spend most of our budget on experiences versus accommodation. For us, hotels are generally a place to pass out and re-charge our cameras, since we tend to be out and about most of the time. We rarely find it justifiable to spend a lot of money for a room that we do nothing but sleep in. The Kempinski was legendary, and the Dead Sea is an experience, not just a place where you sleep, they also offered massages in the most romantic looking spa. How could Kevin and I visit the Dead Sea and not get a couple’s massage, complete with Dead Sea mineral treatments when we were going to be in the Dead Sea itself? I had no doubts that the hotel would be worth it! Entering the hotel required a heavy, even by Jordanian standards, security check. The underside of our van was checked and we needed to go through metal detectors and have our bags checked on our way in. This was no big deal as going through metal detector doors with a security guard has been standard fare in our travels throughout Jordan. The grand lobby of the Kempinski hotel greeted us as we entered through the main doors. From the entrance, we could see the main attraction, the Dead Sea, off in the distance. There were several agents waiting to check us in so there was no wait time. As Kevin provided our information to the front desk, an assistant manager brought out two adorable camel stuffies and gave one to C and D. That sealed it for the kids. This would be their favourite hotel in the entire country of Jordan. Those camels were their best friends for the rest of the trip! The check-in was seamless and a bell boy accompanied us to our room all the while telling us about the amenities of the hotel. I credit his patience, even as C and D insisted that they ride the luggage cart through the entire hotel! The Kempinski hotel has 342 rooms, suites and villas spread over 3 buildings. 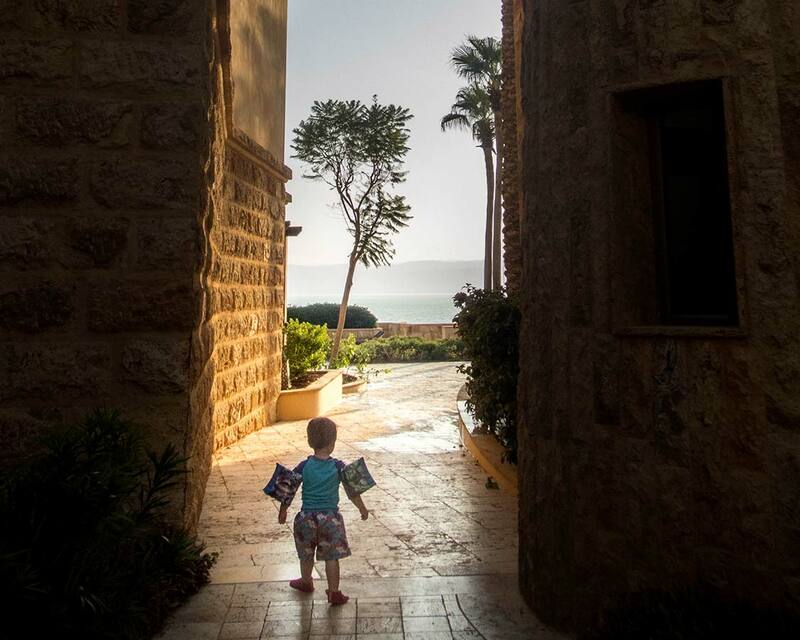 The resort is designed so that all rooms have a view of the Dead Sea. We had opted for a superior room and our king sized bed was separated from the kid’s queen bed by a half wall. The bathroom had a full sized shower and a very large tub on the opposite side. We were on the bottom floor and when we opened the double doors to our terrace we could hear the serene sound of the sea lapping against the shore. The children quickly ran to the fridge and were instantly hungry when they saw the complimentary snacks and chocolate bars. Since we were about to head to lunch, they had to settle for the for the complimentary fruit with the promise of a treat for dessert if they ate all of their lunch. The Kempinksi hotel has 9 nine pools and C made it his mission to try and go into each and every one of them. One pool, the infinity pool, was listed as for adults only, so he had to take a pass on that one, but to his credit, all the rest of them were visited. One of the pools had a very cool bubble fountain that many of the children at the resort seemed to enjoy even more than the splash pools at the other end of the hotel. We all had so much fun splashing and exploring that Kevin and I never even made it to our massage. The Kempinski hotel also a fitness centre and tennis courts. 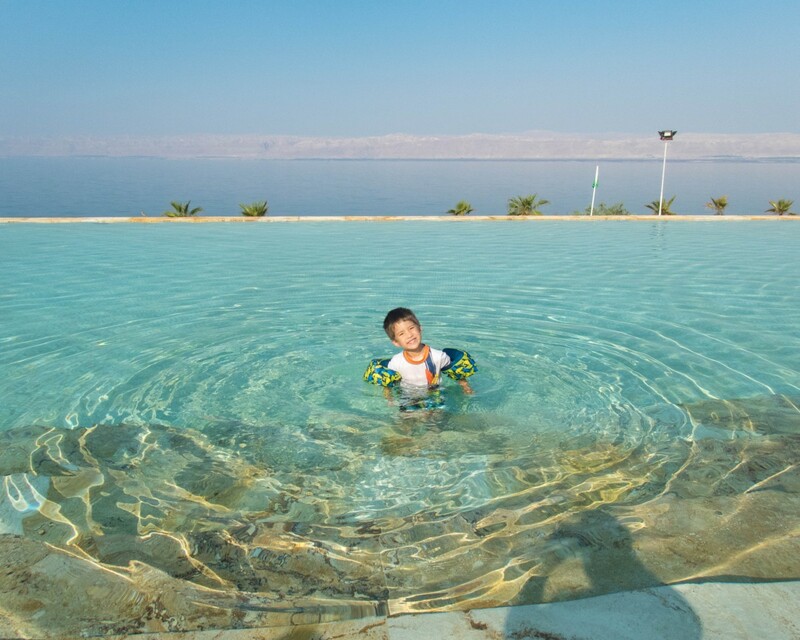 But between the time spent in the various pools and the Dead Sea we didn’t have time to explore either option. The hotel also offers complimentary wi-fi throughout the grounds and we found that it worked exceptionally well. Of course, the main draw of staying in the Kempinski hotel is that it is located on the rocky banks of the Dead Sea. The shoreline directly behind the hotel is strictly for hotel guests only. During high tourist season this can make a huge difference as tourists flock to the area on day tours from Amman and public entrance points into the Sea can be quite crowded. There are also mud stations located at strategic points that are manned by hotel staff who can give you a hand getting dirty. For the price, we expected a lot from the Kempinski Hotel. I am happy to say that we do not regret our decision as the hotel continually surpassed our expectations. In fact, we debated extending our stay at the beautiful Kempinski hotel, but Jordan’s famous Desert Castles were waiting . I’ve stayed at two Kempinski Hotels; one in Cairo and one in Dubai and I must say that they are so luxurious. The attention to detail, customer service, and wealth of amenities make the stay well worth the cost. 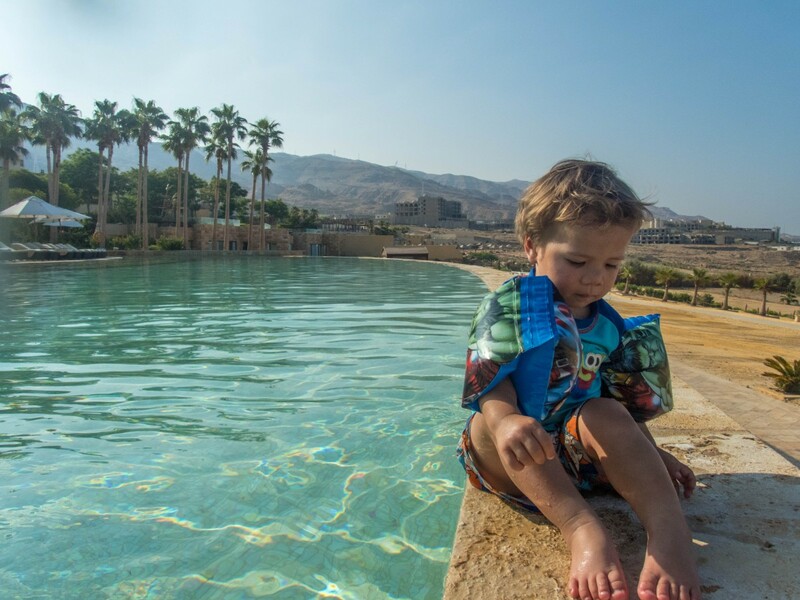 Yeah, looks like a place you could stay in forever – 9 pools with access to the Dead Sea, what more can you ask for… You wouldn’t have to leave the hotel ever. Looks and sounds like you had an amazing time in Jordan too! There are some amazing hotels and resorts along the Dead Sea, and it sounds like this is definitely one of them! We ended at the dead sea, to relax completely before going home. Hmmm…. it’s definitely worth some money to stay at a place like this! Wow, the Kempinski looks amazing! I really want to visit Jordan soon and I think I will use your blog to plan our entire trip. Looking forward to reading about the Desert Castles! I would happily trade in our little tent for a stay at this hotel for a couple of weeks! The Kempinski looks awesome! So cool with the dead sea right there! It definitely looks worth the splurge! What a cool hotel and so nicely situation on the Dead Sea. #totesjelly. It does sound fantastic and with such amazing sights to see all around, I’d happily pay a premium price for a similar experience. The Kempinski chain has a great reputation, and nice to know that one lived up to its name. Looks like you had a great time. The swimming pools sound so inviting! This looks like an amazing trip! I’ve never been to Jordan, and have not yet stayed at a Kempinski Hotel, although I believe I saw one in Dubai. Definitely looks like my kind of place! I’ve never stayed at a Kempinski, but I hung out in them a lot in Dubai – classy places! I visited Jordan and floated in the Dead Sea in 2009, it was a beautiful place to visit. Kempinski Hotel looks awesome! I love the pools and the fact that it’s just beside the Dead Sea. So, how was it like floating in the Dead Sea? Would love to hear about your experience. I’ve never had a bad experience at a Kempinski Hotel and this one looks like it would be no different. Will definitely be looking this one up when I eventually get to Jordan. It just looks fantastic. This hotel looks amazing and the guest only access to the sea is a fantastic idea. 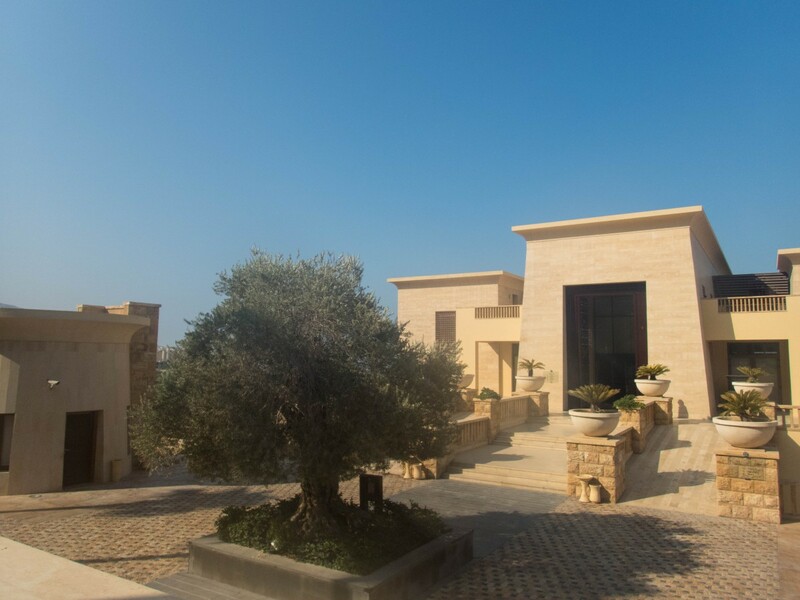 I never stayed at a Kempinski, but attended a conference at their hotel in Gozo once and the business facilities were excellent: I’d love to be their guest one day! The Kempinski is a great hotel chain and is the ultimate in luxury and indulgence. A private beach on the dead sea. That is really a great privilege, and something you would definitely expect from the Kempinsiki.